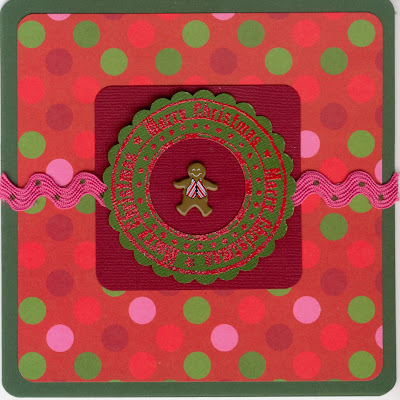 The gingerbread man brad is by Hot Of The Press, the rickrack ribbon by Lil Davis Designs. The sentiment stamp is by Autumns Leaves, I punched away the center part which was a Christmas Tree to replace it with my gingerbread man. One would never know you had trouble getting started on this challenge! Your card is adorable and you've incorporated all the elements perfectly. Thanks for playing in the Res-Q challenge. I commented on this one on SCS, but thought I'd pop over here too to say thanks again for playing along on the Res-Q Challenge. This card is so cute! I love that little gingerbread man in the middle!